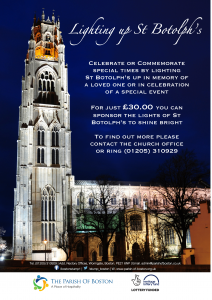 Did you know you can sponsor the lights of St Botolph’s to celebrate or commemorate special times by lighting up the iconic Boston Stump tower? Do something extra special by having the lights of St Botolph’s shining brightly for that special occasion for just £30.00. As well as the lights, you will also be able to leave a message to be placed on our noticeboards to let people know what you are celebrating or remembering. The lights are illuminated between 6 pm-midnight so there will be plenty of time for you and your loved ones to come along and see the lights.